It might go against everything the market is telling you, but you do not need a whole shelf of moisturizing creams. You only need one good organic moisturizer. It should give all of your face the tender loving care it deserves – including the thinner, delicate skin under your eyes – as well as your neck and décolleté. Day, Night, Eye, Face, BB, CC? Moisturizing creams supposedly formulated for specialized purposes are great for grabbing your attention, but there’s hardly any real difference between them. A good moisturizer should protect and nourish every part of your face, including the delicate areas around the eyes. The fact is, one cream is all you need, day or night, for all of your face, neck and décolleté – provided it is the right cream for your skin. The key is to find the right formulation for your skin, and stick to it to reap the long-term benefits. You can easily tell if your moisturizer is working for you. It should plump up your skin and make fine lines disappear – right away. The most obvious sign is that your skin will feel silky-smooth and look radiant. With time, these immediate results should continue to improve. If you are not seeing these results, the solution is not to buy more products for different parts of your face, or for different times of day or night. The solution is to find a good organic moisturizer that works for you! Seeing is believing! If you are using the right cream for your skin, you should see results immediately, and your skin should become more and more beautiful the longer you use it. 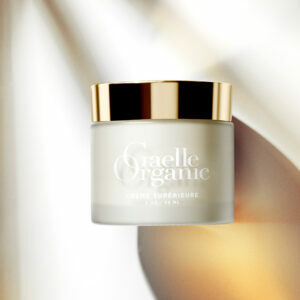 That is what we expect of the organic moisturizers we have formulated. The best organic moisturizers are oil-based. If you have tried organic moisturizers before, and did not see the results you wanted, it may be because the ones your tried contained alcohol as a preservative. Alcohol can be troublesome in skincare, especially on dry skin. That’s why our organic anti-aging moisturizers – Crème Supérieure and, for extra sensitive skin, Ultra Sensitive Crème – are made from fine organic oils and botanical extracts, entirely free of alcohol. Their results speak for themselves! What is recommended for Senior DRY wrinkled skin that can be prone to roseacea at certain times…or with certain products have tried.